Today is Thursday and, since we are finally back on something vaguely resembling a regular schedule, it means that we had P.E. this morning. After a few weeks of lacrosse, I decided it was time to bring back some of the basic elements of the President’s Challenge physical fitness program. I wanted to focus particularly on sit-ups (or curl-ups), push-ups, and endurance running, since those are all activities that each of my students can do fairly easily and can do inside the gym. So I led my class down to the gym, had them do some warm-ups for a few minutes, and then split them into partners. They had three minutes to do as many sit-ups as they could (one student did sit-ups while the other counted and encouraged them). Then they switched places and did it again. I had the class line up, report how many they did, then spread out with their partners again to do as many push-ups as possible in three minutes and then, just like before, they switched places. They lined up, reported their numbers, and then they all gathered in a far corner of the gym and were told to run laps around the gym for five minutes and see how many laps they could do. After reporting their numbers for a third time, I had the class sit in a circle in the gym and take turns sharing one positive thing about someone in the class. This last is something I’ve done from time to time and would like to do more often, as I think it is helpful for the class to remember to keep things positive, especially with one another! Maybe having them do a bunch of sit-ups, push-ups, and running around first thing each morning is the key to decrease discipline problems! Maybe the students will just be so exhausted after their workout that they won’t have the energy to disrupt class! My class has been learning about the American colonial period and the Revolutionary War. They’ve read books, watched films, and researched the colonies. They’ve also been working on a mini-project comparing colonial colleges to modern-day universities. Today I had them crack open the social studies books we have in the classroom to discuss the background on the Declaration of Independence. I started reading through a section with them, but it quickly led to a conversation about what was written and what was going on at the time. It was particularly interesting when we started to discuss the French and Indian War and the kids brought up the question of the presence of Native Americans. This is something we’ve discussed more than once, and I was not at all surprised to have it come again. The textbook mentioned that the English colonists wanted to expand westward toward the Ohio River Valley, but the French had already claimed the area and settled it. The students were appalled that the French and the British were fighting over land that was already settled by the Indians. This led to a very brief discussion about how the Europeans tended to ignore the land ownership of indigenous peoples. The French and Indian War was, like most wars, very costly, and this is why King George III started taxing the colonists. When he decreed that they could not, in fact, settle further westward, they were upset, and he sent more soldiers to make sure they stayed where they were. The combination of soldiers, taxes, and general tyranny led to the colonists to seek to sever their ties with the king. The kids enjoyed this video so much that they insisted upon watching it–three times! They also started singing along with the chorus, asked if I could find the lyrics (they are here, by the way), and wanted me to include a link somewhere. I told them that I would being posting it on my blog today and I’d include the address in my letter to their parents on Friday. All in all, it was a great moment in the classroom and reminded me that I definitely need to use music more often in my teaching! Over Spring Break, I had an opportunity to chat with a friend of mine about what is taught in fourth grade, particularly in math. He is in a railroad engineering program, and has to use fairly advanced math on a regular basis for his work. But then he pointed out that he only uses advanced math for his rather technical work. When it comes to day-to-day activities, the type of math he uses, if he uses math at all, is essentially what I teach my students: addition, subtraction, basic multiplication, division, fractions, and simple probability. So, of course, I decided to use this as the springboard for math instruction today. Because, you know, having an engineer admit that the math he learned in fourth grade is what he uses most often is much more impressive to my students than to hear it from their teacher. I have two math groups in my class. I told the first group about this, and then transitioned into a story about my wife and I eating some red velvet cake over the weekend. I explained that I made a cake, cut it into twelve pieces, and then had to leave for a few hours. While I was gone, my wife at a fourth of the cake. When I got home, I ate a third of what was remaining. I asked them to figure out how many pieces of cake we each ate. With the other group, I talked about planning a trip to Kansas City, Missouri, to visit my oldest brother and his family at some point. I explained that it will take about six hours to drive there, and we need to figure out how much gas we will need to get there. I told them that we know the trip to Washington, Illinois, where my parents live, takes about an hour and a half by car. So I asked them to figure out how many times longer the dive to Kansas City would be. Then I said that we use about three gallons of gas to get to Washington, so I need to figure out how much gas it would take to get Kansas City. I wrapped up with pointing out that gas currently costs $3.96 per gallon, but we should just round up the number to figure out about how much gas we’ll need for the round trip. After each group figured out the answers to these problems, I reinforced the point that this is the kind of math adults use every day; the same kind of math that they are learning right now in class. Of course, that doesn’t mean advanced math doesn’t have its uses. People definitely do use calculus for some types of work. But when it comes to daily activities, most of us aren’t going to break out the quadratic equation when figuring out how much gas will cost for a trip. That didn’t stop me from quickly throwing the equation up on the board, just to show them what it is. After all, my high school calculus teacher, Mr. Charles “Chuck” Brunner, spent an awful lot of time helping me and my friends learn it. And now, ten years later, I still remember it: x equals opposite of b plus or minus the square root of b squared minus 4ac all over 2a. 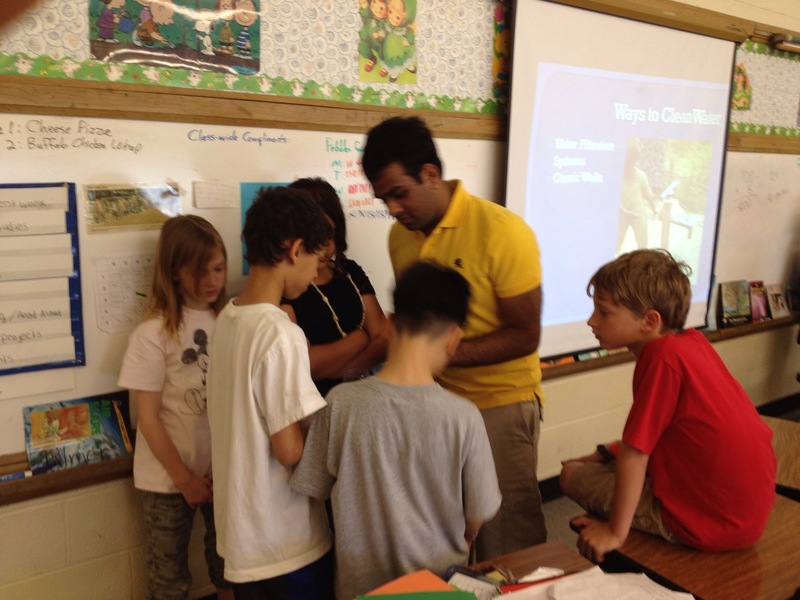 One of my preferred methods of teaching is inquiry-based learning. There are many aspects to this, but the one that I like to focus on with my students is simply the process of asking questions and then finding answers. I have been tying this into our science work during the past few weeks, and plan on continuing to do so for the rest of the year. 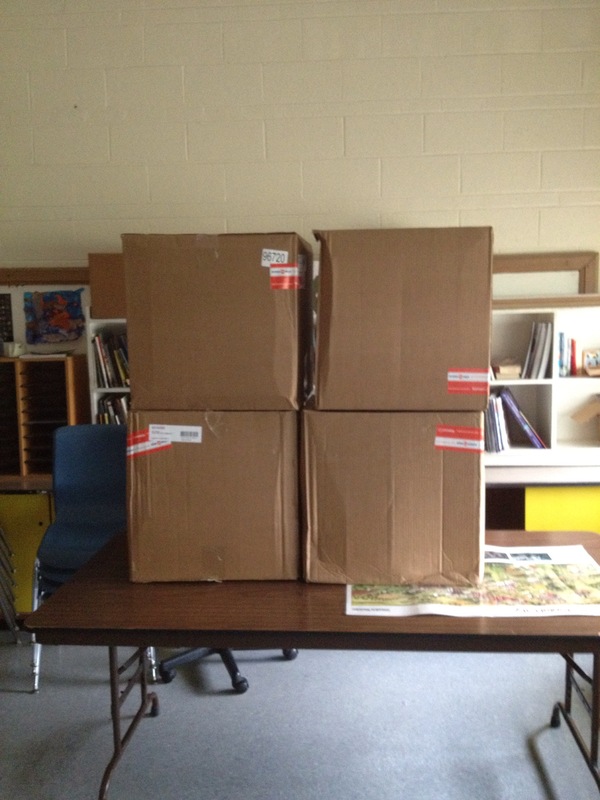 As you may know, I had recently placed an order that resulted in four large boxes ending up in my classroom. Today was our first day back after Spring Break, and I was very pleased that the students were immediately captivated by the four boxes stacked up on our reading table. I made sure they knew that no one was allowed to touch the boxes, but they were allowed to look. On the board, where I write a message to get them started each day, was the assignment to take out a piece of paper and write about what they thought was in the box and why they thought that. After getting through the first part of the morning, I donned my lab coat and asked the students to share their predictions. 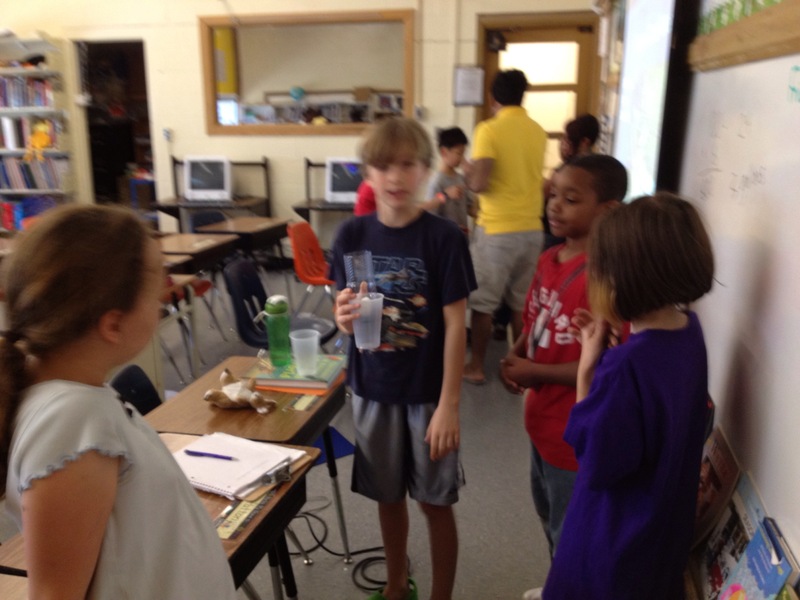 Many of them immediately knew what was coming next: observations, more observations, and then an explanation. I didn’t ask the students to share their predictions with the class. What I did do is allow them to make further observations of the boxes by watching what I could do with them. I lifted them, demonstrated how tall they were in comparison to me, and shook them around a bit. The students then amended their predictions. Then I looked inside the boxes and told them that the boxes contained items that were red, yellow, green, and black. 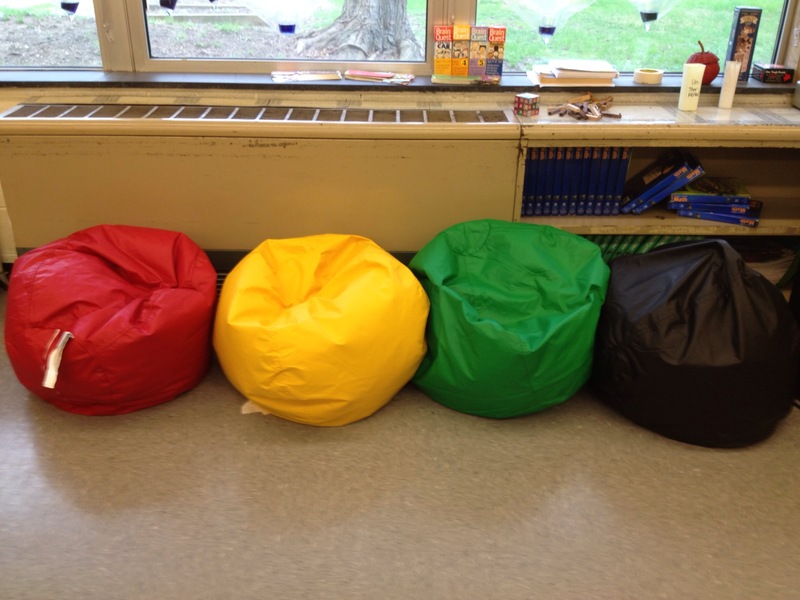 Our new beanbag chairs will, of course, be used on a regular basis as we move into a new approach to literacy instruction in our classroom. But more on that, later. Monday: Went to the classroom and did some housekeeping in the morning. Tuesday: Served as an Election Judge for Champaign County’s primary elections in the Cunningham 7 and 8 precincts in Urbana. Wednesday: Decided to have one day during which I would do absolutely nothing productive; I finished a book, watched several episodes of The X-Files, and took a two-hour nap. Something’s coming to my classroom! I hope my students enjoy the surprise! I’ll be working on third quarter report cards during most of tomorrow. Happy day! Spring Break has officially started! But before the students went home today, they had a lot of work to do! The students spent the morning watching a video about Colonial Williamsburg called, simple enough, Williamsburg: The Story of a Patriot. After watching the movie, which follows the story of John Fry, a fictional composite character from the colonial period, they completed a Venn diagram comparing John Fry with Johnny Tremain. After identifying their differences, we worked to identify what they had in common. Some of the similarities the students identified included really simple things like they were both men and they were both named John. After working on identifying the similarities, they had to write a one or two sentence conclusion. One of the conclusions suggested was that although Johnny Tremain and John Fry led different lives, they were both committed to fighting against the British. After the film and Venn diagram, we had a penny basketball tournament. Just before lunch, I called my mum during her lunch break and wished her a happy birthday. Then the students sang Happy Birthday to her, which was pretty awesome. 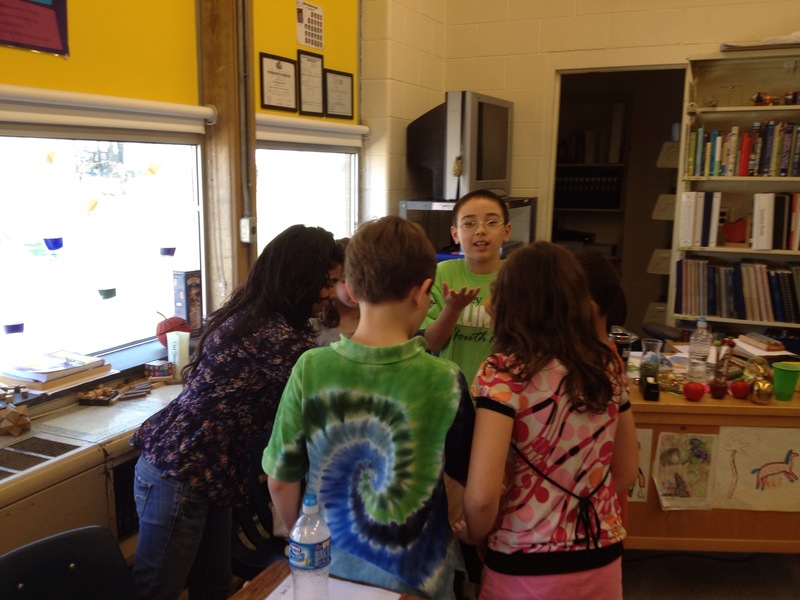 The day got wrapped up with a special visit from members the University of Illinois Quench Foundation. They came to talk about the need for clean drinking water in developing nations, especially in Sub-Saharan Africa, Southeast Asia, and Latin America. 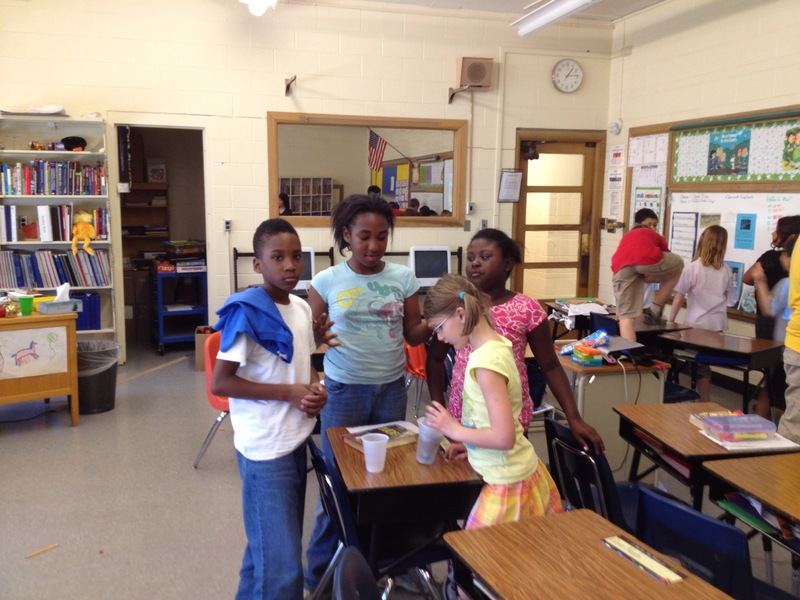 They also showed the students how to create a water filtration system using sand, gravel, and rocks. 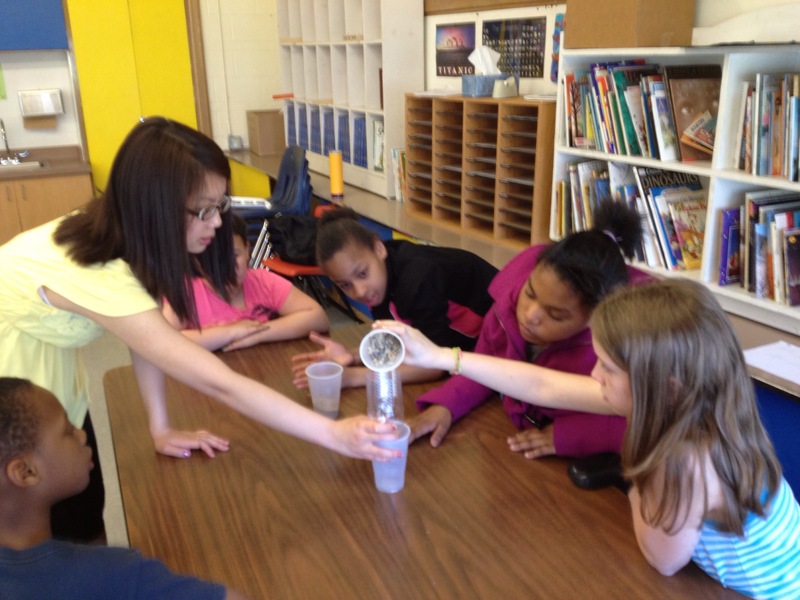 The class really enjoyed the presentation, especially the filters! Having successfully completed the last week of the third quarter, we now get a week off for Spring Break before we get back to work on March 26. Enjoy the break, everyone! I may post during the break, but no guarantees. As has been mentioned several times now, this week has been a week of special guests and visitors for our classroom. One of the special guests we’ve had is a fellow participant in the Literacy Across Content Areas inquiry group who works at the University of Illinois as one of the Teacher Collaborators. (He is, incidentally, different from the other Teacher Collaborator who was with our class on Monday morning to check out what they were doing on Storybird.) He has worked with my students each day this week to introduce them to a game he created called Penny Basketball. Penny Basketball is an easy game that allows students to explore fractions, ratios, and percents while interpreting data in a fun and engaging manner. We started on Monday with the introduction of the basic concepts behind the game and taught the students how to shoot free throws. We spent two days discussing how to determine who the best penny basketball free throw shooter in the class is by recording successful shots and comparing them to the number of shots taken. Students were randomly assigned a number of attempts they could take: 6, 8, 10, or 12. Then the students compared the fractions within groups and then across the class. After trying to compare fractions, we showed them how to convert fractions into percents and compared them again. Yesterday was the introduction of the full game of Penny Basketball and we asked the students to consider the question of who is the best penny basketball player in the class. We then had the class play the full game for several rounds today and record data. It has been a lot of fun watching the students learn how to manipulate numbers, record data, and realise that there are multiple ways to interpret the same information. We are going to spend one more day on Penny Basketball tomorrow. 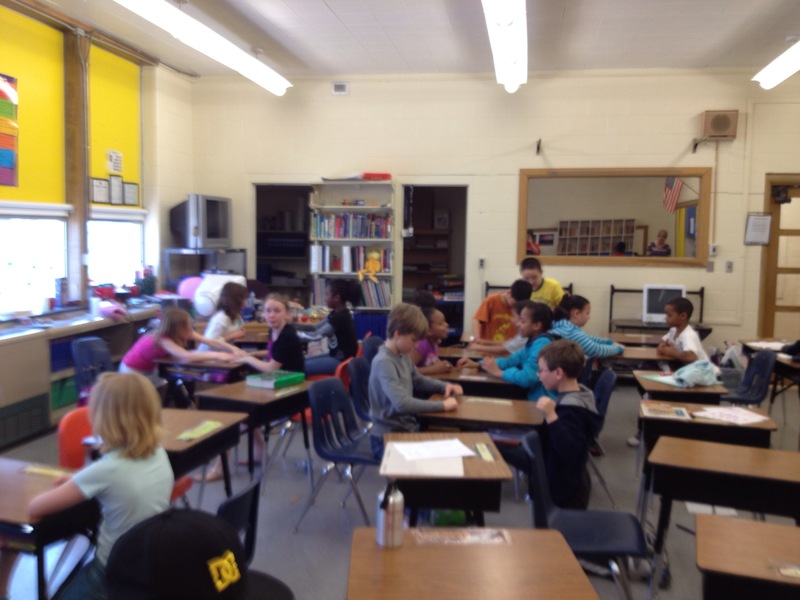 I am going to set a new challenge for the class: instead of trying to determine who is the best, I want them to figure out how to arrange the game so that everyone does really well. In other words, instead of competing against each other, I want them to learn how to work with each other.